Wise Care 365 find duplicates wiped up all my data and programs! wise care 365 Wise Care 365 find duplicates wiped up all my data and programs! 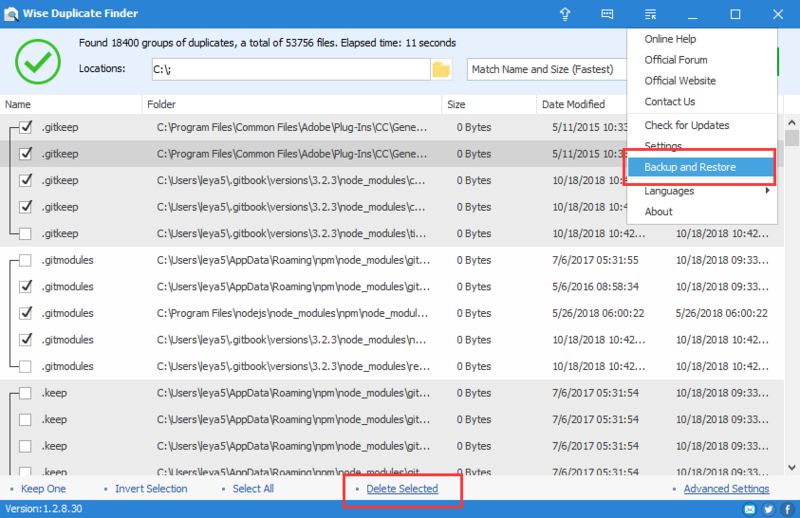 I recently used wise care 365 find duplicates option to remove all the duplicate files and free some space of my laptop under Widows 7. It found more than 130k duplicates with files range from 0 byte to man G-byte, I used the option to keep just one and delete all other duplicates (I took the fastest option of scan). now when I start my PC it boots normally to my desktop, but it looks now dry! it wiped up every file and programs I have, office windows restore and recovery option doesn't work, and all folder are still existing but empty! what I should now do? can I restore the deleted files. I think it just removed all the paths and links to the programs and data. can somebody please give me a hint what I should do? is there any program can restore files and programs that duplicates finder killed! By the way, if it worked, it should have made a backup (if you didn't change its options). Check menu, settings, backup folder. There's also a "backup and restore" function, always in its menu. thanks for your replay, unfortunately there are no backup left, the program itself is not working properly after this cleanup, please have a look to the attached pic! 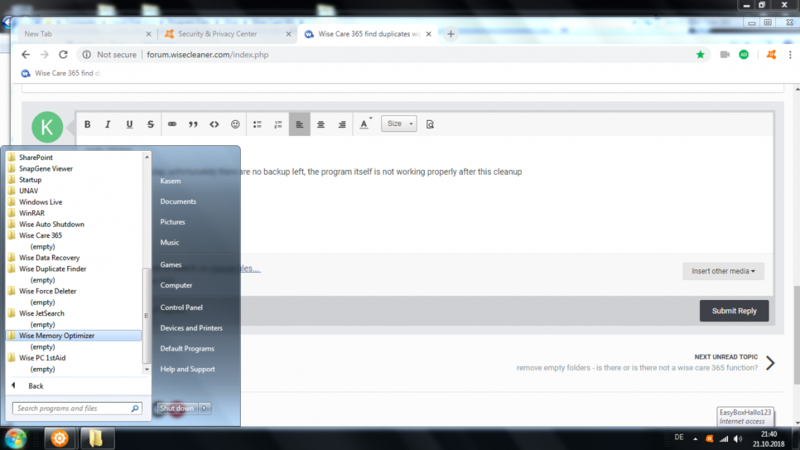 1, Wise Care 365 won't clean installed programs, unless you add its parent folder to clean list. 2, Wise Duplicate Finder find only duplicate files, not duplicate folders. And it only remove files. If you remove files one by one, I mean, you select a file and delete it manually, wise duplicate finder won't backup it. Only if you select multi files, and click "Delete Selected", wise duplicate finder will back up files. You can find backup in Menu - Backup and Restore.